The number of "supergiant" gold deposit discoveries has dwindled from two in the past five years to zero in the past two years and ore grades have tumbled from an average of 12 grams per tonne in 1950 to roughly 3 grams per tonne in Australia, Canada and the US. As Pierre Lassonde of the Franco-Nevada Corp. gold streaming firm recently quipped: "the next cutoff grade is dirt." 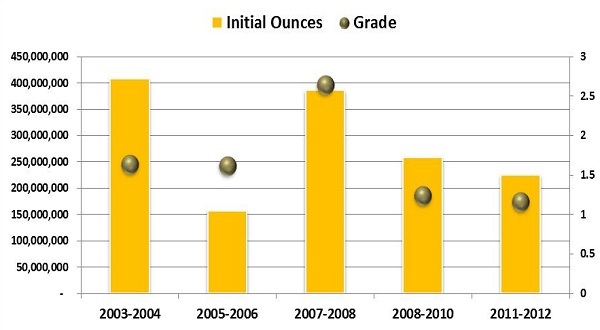 Research released today from Intierra Resource Intelligence adds to this story of decline of both quality and quantity in gold production from 2003 – 2012. The declining rate of new gold discoveries and grades across the global market during the last decade has accelerated over the last 4 years. 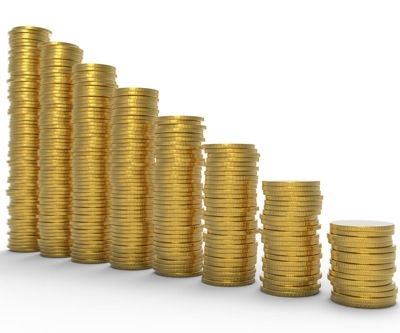 Over the course of the 10-year time-frame, Africa lead the way with new discoveries of 479 million ounces of gold with an average grade of 2.8 grams per tonne. Next was North America, although with significantly less new ounces of 290 million, and with a much lower grade of 1.3 grams per tonne. Data and analysis from IntierraRMG reveals that the 2 year period from 2003 to 2004 was the best in the study range, with over 400 million ounces of new gold discovered. This includes inferred, indicated and measured ounces with an average grade of 1.65 grams per tonne. In contrast, 2005 and 2006 had the lowest number, with just over 150 million new gold ounces discovered – albeit with a similar grade.